Filled with seemingly endless middle-ground fare, 2010 proved to be an easy year to make a “Top 10” list, if only because the selection was limited. Since most of the major releases throughout the year proved to be disappointments or just plain bad, few heartbreaking cuts had to be made. But the handful of great films to come out of 2010 are no less significant for the year’s otherwise rocky cinematic offerings. The year’s best films were thoughtful pieces of entertainment, while at the same time being complex thrillers, touching character studies, and at times socially reflective masterworks. These are the best of the best, regardless of genre or subject matter. Per usual, if you haven’t seen them yet, seek them out in cinemas, add them to your rental queue, or pick them up for your DVD or Blu-ray collection. You won’t find better films in 2010. 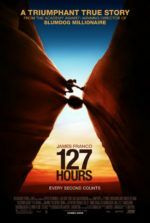 Popping with the same energy that made films like Trainspotting and Slumdog Millionaire sweep audiences away with their momentum, Danny Boyle’s 127 Hours defies the limitation of its plot to become a film about its hyperactive direction. James Franco delivers a powerhouse performance as Aron Ralston, who survived being pinned down in the mountains by cutting his arm off to escape, and involves the audience in a harrowing tale of survival—even if most of it takes place within Ralston’s head. Franco is sure to earn himself an Oscar nomination, which is due after credible performances in Milk and In the Valley of Elah. Boyle’s frenetic direction is showcased, as most viewers entering the picture will probably have read about Ralston’s trials and therefore know the outcome. And with the booming soundtrack, cockeyed angles, and vigorous sense of movement, Boyle transforms a tale of immobility into one of the most exciting viewing experiences of 2010. 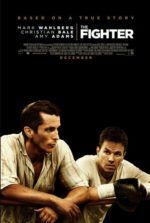 Though the visual flourishes of director David O. Russell (Three Kings) are typically what audiences remember after his films, with The Fighter, everyone will walk away talking about the acting. Christian Bale’s performance as a rattled yet strangely charismatic crackhead steals the film in a way that demonstrates his status as one of today’s finest performers. In the true story of boxer “Irish” Micky Ward (Mark Wahlberg), the central boxer’s familial entourage plays an equally central role. Melissa Leo is his no-nonsense mother, and Amy Adam sheds her princess gown for a vulnerable townie role. They’re all telling Micky how his career should be, and ultimately they all have hard lessons to learn before the picture’s rousing finale. What it all amounts to is a boxing picture that, curiously, doesn’t dwell on the inner struggle of the boxer, rather considers a whole family with demons to overcome. 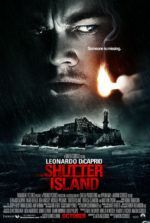 Martin Scorsese’s Shutter Island may not make many “Top 10” lists because, outwardly, it aims to be no more than a complex psychological thriller. But this film demands to be seen more than once, and, with multiple viewings, its eerie presentation of dream imagery and Hithcockian suspense only improves and expands the feature into a devastating drama. Scorsese creates a haunting atmosphere of paranoia and shifty-eyed figures, one that houses a feeling of unease in the viewer until the last lingering frame. This is saying nothing of the cast, starting with Leonardo DiCaprio (but also Ben Kinsley, Mark Ruffalo, Max von Sydow, Patricia Clarkson, and Michelle Williams). DiCaprio had another colossal year showing audiences his keen eye for material. Both Inception and Shutter Island demonstrate not only the actor’s range, but his desire to work with great directors, which will only serve him well. Under Scorsese, DiCaprio has done some of his finest work; and while this film may not be as “important” in their respective careers as The Aviator or even The Departed, it’s a triumph of tone and style that’s unnerving as it is exquisitely crafted. Luca Guadagnino’s I Am Love wraps the viewer up in the burgeoning emotion that leads to the film’s wondrously melodramatic conclusion. The crescendo begins ever so subtly, until the music swells, the cutting becomes more severe, and the immediacy of everything so understated before becomes heartrendingly clear. Tilda Swinton gives the year’s best female performance as an invisible wife brought into an Italian family of businessmen, and she deserves another Oscar for her role. Guadagnino carefully guides Swinton through a woman’s growing emotional dissatisfaction, releasing the audience through her vindicating affair and eventual revolution against her family. It’s a gorgeous production, evoking a brand of luscious, visionary arthouse European cinema that inspired Visconti to make The Leopard or Bergman to shoot Fanny & Alexander in all their sumptuousness. Audiences accustomed to mainstream cinema may not have the endurance for Guadagnino’s gradually building structure, but those with the patience for sophisticated filmmaking will enjoy the film’s extravagant rewards. 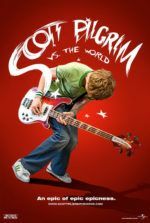 Underseen and underappreciated, Edgar Wright’s Scott Pilgrim vs. the World observes youth culture, with all the comic books, videogames, and dirty rock’n’roll it has to offer. But through the material, Wright utilizes an arsenal of cinematic trickery to create a celebration of bravado editing, arcade-inspired special effects, and comic strip structure to deliver a presentation beyond compare. Like pure geek energy was transferred onto film, the screen pops with references galore in a sweet and funny slacker comedy setup—one so hilarious and fast-paced that even the mildly grating presence of Michael Cera is washed over. Some viewers saw only shallow characters interacting in a contrived romance; but the stylistic flourishes give way to some striking lessons about surfaces that are only further reinforced by Wright’s ironic visual delights and the videogame plot structure of Bryan Lee O’Malley’s graphic novel. However, there’s a very limited audience that will appreciate everything the film has to offer, making it a love-it or hate-it release. But for those who can spot all the references and visual cues, there was hardly a more entertaining movie in 2010. Every year offers a British costume drama that could be considered “Oscar bait”, and they’re usually purveyed by the Weinsteins. 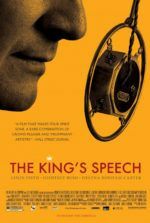 And though The King’s Speech fits that description, there’s no denying that what results from the two central performances by Colin Firth and Geoffrey Rush is bloody brilliant. It’s the year’s best “feel-good” movie, avoiding transparency in any of its many formula storytelling devices. Indeed, a film about the Duke of York overcoming his speech impediment hardly seems like cinematic subject matter, yet the dramatic weight behind this picture, and its performances, is nothing short of staggering. Firth and Rush deserve awards consideration for their roles, particularly the former, for giving a complex performance with pitch-perfect (mis)annunciation and emotional clarity. A heartwarming human drama, this elegant production reflects on an obscure sidebar in history with considerable class and humor, and finds a mainstream audience cheering in the process. 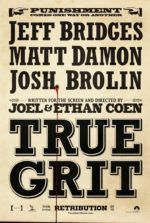 Joel and Ethan Coen show Hollywood how to handle remakes with True Grit, a leaner, more complex film than the 1969 original starring John Wayne. While their picture has no intention of reinventing the Western genre, the Coens deliver a solid tale told in a classicized style, with just the right amount of cinematic edge to reveal the filmmakers’ auteuristic personality. More faithful to Charles Portis’ source novel, the Coens make great use of the timely 1880s language, which supplies the film with the Coens’ always unique dialogue. Jeff Bridges outdoes even The Duke with his portrayal of the flawed Rooster Cogburn; Matt Damon brings life to his Texas Ranger role; but it’s newcomer Hailee Steinfeld who commands the screen in her first-time appearance in a major motion picture. Filled with a quiet yet coarse tone that’s as unforgiving as it is affecting, the film succeeds in every way that the original faltered by being so much more than just a showcase for an actor in the breakout Cogburn role. Here is a film that at once captures the romanticism and the violence of the West with impressive craft and artistry, yet does so with the dynamic quality only the Coens can provide. Hollywood today is all about demographics. Films are made to appeal to select viewers, with “chick flicks” and “guy movies” and children’s entertainment segmenting audiences into their respective age, class, race, and gender groups. Yet Pixar transcends all that by tapping into universal themes and making the movies about a shared experience again. Toy Story 3 reminds one that films can contain no end of adventure and emotional truth, yet not outcast specific sections of the audience. 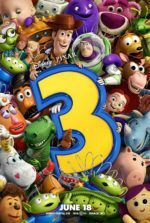 Certainly the best in the Toy Story series, it completes the trilogy with class and touching insight in ways rarely (if ever) accomplished by a “Part 3”, offering better animation, not to mention more tears, laughs, and thrills than the 1995 and 1999 films. You’d have to have a heart of stone not to well up with sadness and joy from this film. It’s one of Pixar’s pitch-perfect releases that demonstrates how, as the top animation studio working today, they elevate animation into a class of high cinema. 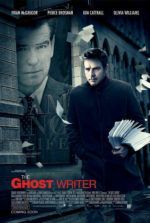 Roman Polanski had a rough year, but he reminded cineastes why he’s regarded as one of the greatest living directors with The Ghost Writer, a modest thriller that’s composed with subtle whit and chilly suspense. Ripe with biting political commentary and a wealth of cynicism, the story proceeds like a clever detective novel whose tension never drops. Polanski exercises such control over his craft and performers (wonderfully acted by Ewan MacGregor, Pierce Brosnan, Olivia Williams, and Kim Cattrall) that his status as a master of suspense hasn’t felt this strong since Rosemary’s Baby. Under it all, there’s a lasting, jet-black humor that takes the viewer by surprise; it’s Polanski’s signature, using humor to allow uncomfortable laughs to be met by a sneaking notion of danger. This elegant, devilishly terrifying achievement in tone may elude viewers with its deceptive simplicity, but Polanski’s sure directorial hands have rarely been more confident or engaging. An edgy statement on emotional detachment in the Digital Age, The Social Network takes the unlikely subject of Facebook and turns it into an engaging drama. 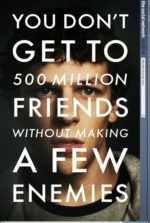 Jesse Eisenberg’s version of Mark Zuckerburg is just as socially inept as one would expect, with perfect doses of narcissism and deficient self-identity that prevail within today’s web-based communities. Moreover, it’s made with a style that persists through the largely dialogue-based scenes leaning over computers or seated in conference rooms. Director David Fincher (Zodiac) shapes Aaron Sorkin’s intelligent script with masterful hands, using great care to capture the rapid-fire dialogue with style and subtle wizardry. Fincher’s presence recedes to the inattentive viewer, as he uses understated special effects to allow the story to emerge. Consider the Winklevoss twins, played by Armie Hammer; Fincher superimposed Hammer’s face onto a double to create the illusion of identical twins, and the effect is flawless and invisible. In an ideal partnership of writing and direction, Sorkin and Fincher have delivered one of the most socially significant films in recent memory. With Inception, writer-director Christopher Nolan culminates his work thus far into a tour de force of incredible scope and intellect. Present in the film are the structural complexity, themes of self-deception, and emotional drive of Memento; senses of magic and narrative showmanship derived from The Prestige; the gravity and sheer blockbuster scale of his Batman films. Detractors have had their say, but like a dream, Nolan’s self-contained world of the film plays by its own rules, and those rules are so clearly defined—despite their complexity—that anyone can follow. That so many viewers “get” and discuss such a complicated scenario is a testament to Nolan’s filmmaking—his ability to conceive of such an ambitious project and then execute it with such clarity and wowing bravado. He brings together the basics of great cinema by employing hearty symbolism, strong narrative drives, and visual wonder in a marvel of style and content. What’s more, Nolan does it all with such showmanship, demanding that audiences return to the film again and again to mull over what that ending means (And isn’t it remarkable that, though the ending avoids giving a sense of finality, it feels perfect, even satisfyingly elusive?). 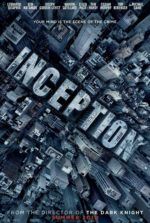 Inception is a rarity: a thinking-person’s film wrapped up in an adventure, and a sure classic for future cineastes.